Another thing that got redesigned under Bada 2.0 is the gallery, which - to no one's surprise - takes after Android. It's fluid and efficient, and prettier than in previous versions. The gallery supports kinetic scrolling or panning so you can skip images without having to return to the default view. Just swipe to the left or right when viewing a photo in fullscreen mode and the previous/next image will appear. Pinch zooming is also available but you can also double tap on the screen to zoom in and out. The Wave Y gallery shows the pictures in full resolution unlike most Android handsets, so zooming in on a picture will reveal much greater detail. Like the Android galleries, the Wave Y offers rotate and crop tools too. The interface of the video player is quite simple. The Wave Y supports MP4/H.264/MKV files, but it does not include support for AVI files, regardless of format. Subtitles were not recognized either. Just like the gallery, the Bada 2.0 music player is designed to look like the one in TouchWiz-skinned droids. The interface is laid out in four tabs for the available sorting options: all artists, all tracks, playlists and albums. The user interface looks even better when you use the music player in landscape mode. Browsing albums or tracks is pretty standard in portrait mode: you get a list of all songs or albums, each with a small thumb. The list is smoothly scrollable with impressive kinetic effects. 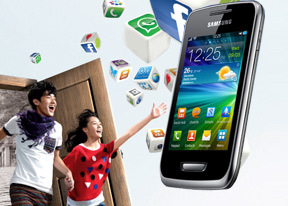 The Samsung S5380 Wave Y is equipped with an FM radio with RDS. You can navigate to different stations by dragging across the dial on the top, or using the arrow keys below. You can also save up to 8 radio station presets. The interface is slightly different than the one found on the Wave 3, mostly due to the fact that it does not feature FM audio recording. You can also listen to the FM radio on the loudspeaker, but the headset is still needed to serve as an antenna. The Samsung Wave Y S5380 did fairly well in our audio quality test. It's not the best we have seen, but it certainly does better than its price tag suggests. When connected to an external amplifier, the smartphone got impressive scores all over the field, with the average volume levels the only thing that could possibly be improved. 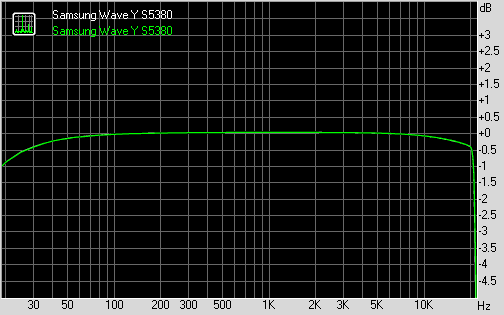 When headphones are connected, there is plenty of degradation in terms of stereo crosstalk. It gets pretty high, but that's about the only score to take a notable hit, so it's not too bad overall.